The OAFP Foundation is pleased to sponsor the following awards. Award recipients are formally honored during the Ohio Academy of Family Physicians Academy Awards Dinner, which is part of its Family Medicine Celebration (annual meeting) held each August. 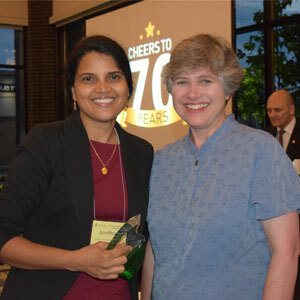 Congratulations to our 2018 Family Physician Mentorship Award recipient Jaividhya Dasarathy, MD, FAAFP. The Foundation’s Leroy A. Rodgers, MD, Preceptorship Program family physician preceptors are eligible for nomination, but nominations are not limited to those program preceptors. Has been in practice for more than three years. Ohio medical school departments of family medicine, family medicine interest group advisors, and medical students are encouraged to nominate preceptors who have demonstrated exemplary precepting skills. 2019 nominations will be due in the spring 2019. The Ohio Philanthropist of the Year Award was established in December 1997 by the board of trustees to recognize an individual or individuals with a proven record of exceptional generosity who, through direct financial support, has demonstrated outstanding civic and charitable responsibility, and whose generosity encourages others to take philanthropic leadership roles on a community, national, or international level. Based on the nomination criteria for this award, candidates are typically chosen by the Foundation Board of Trustees. However, if you have a candidate in mind, please contact Director of Foundation & Strategic Programs Kaitlin McGuffie or call 800.742.7327.